I work with farmers and researchers to bring together science and application of perennial grains, especially Kernza, also known as intermediate wheat grass. Share your information and we can post on this site. Can Modern Agriculture be Sustainable? As the perennial grain Kernza® continues to be featured in agricultural news articles and press releases, the level of interest in this new crop for both buyers and farmers continues to grow. This is especially true given the recent announcement of General Mills’ plans to incorporate Kernza® grain into cereals and snack bars under their brand, Cascadian Farm Organic. Kernza® is the trademarked name given to seed or grain harvested from a perennial forage grass called intermediate wheatgrass. Efforts to domesticate intermediate wheatgrass into a grain crop were initiated in the 1980s by the Rodale Institute and taken over by The Land Institute in 2003. What exactly does it take to grow this hip, new grain with long roots and a wild past? Of course there are differences in the management of this crop compared to an annual. This article offers some answers to agronomic questions from the viewpoints of three farmers in the Midwest, each with varying levels of growing experiences with this new crop. We interviewed each of them on their approaches to planting, managing and harvesting intermediate wheatgrass for grain. University researchers and farmers have shown that intermediate wheatgrass can be planted using a standard grain drill. Carmen Fernholz, an organic farmer in Madison, Minnesota, first planted two acres of this crop in 2011. When asked about the planting process he said, “Planting really wasn’t a challenge. I used my regular grain drill. I had a pretty good, firm seed bed and planted the seed very, very shallow- not even a half inch deep, almost like planting prairie grass. It stayed fairly dry that fall, but eventually we did get germination and emergence. Then the next spring, the stand really took off and it gets thicker and thicker every year.” Randy Hampshire farms in Kingston, Michigan and just planted intermediate wheatgrass this past fall using his Oliver grain drill. He explained, “I planted it on two acres on top of a hill along with buckwheat. I wanted a nurse crop to come up with it and that seemed to work beautifully. I seeded with a conventional grain drill. I just had to figure out which setting to put it on. I started using the setting for grass seed but it ended up being a little too big for that one so I went the next size down and that one worked better”. Using nurse crops on an organic farm helps reduce weed challenges as the crop becomes established. Buckwheat dies with a killing frost so there is relatively little management needed for termination and the dead plants act as a mulch around the young intermediate wheatgrass plants, reducing weeds in the field. Farmer Jack Erisman, located in Pana, Illinois planted intermediate wheatgrass in 2011 as Fernholz did. He planted ninehis past fall he planted 18 more acres of the latest generation of intermediate wheatgrass seed using an air seeder that he often uses for other small seeded crops. University researchers have been recommending that farmers plant intermediate wheatgrass in rows, though the ideal row spacing is still to be determined. Erisman chose an alternative approach for spacing; “Everybody has been talking about rows and cultivation and it just seemed incongruous to me to take something as a perennial and then go and cultivate it. So, we’ve always just solid seeded it.” Planting date varied among each of these farmers, but each of them planted in the fall around September. Dr. Jacob Jungers of the University of Minnesota states they’ve found this timing is the best time to plant, and that establishment is better in the fall than in the spring due to less weed competition. Fertilizer inputs also varied among farmers. In the 5+ years intermediate wheatgrass has been growing on Fernholz’s farm he has applied hog manure once during the second year at a rate of 65 lb N/acre. Erisman followed a similar approach and applied composted cattle bedding at a rate of 1-1.5 t/acre. Hampshire stated he had to adjust for some low fertility in the field where his Kernza was planted this fall and applied 2 tons of dairy compost per acre before planting. Erisman said he used a standard combine using the standard setting for grass seed, and his thoughts echoed Fernholz regarding the way intermediate wheatgrass ripens and addressed it by cleaning it right away. “One thing we did do is have it cleaned fairly soon. In my short experience, you can harvest it at different stages. It doesn’t necessarily ripen as evenly as you thought it might. So when you harvest you might have some green in the grain, so you want to clean it pretty quickly,” said Erisman. Grain yields still seem to vary quite a bit. The average grain yield is around 500 lb/acre, but, as with any crop, Kernza® yields are dependent on weather. Erisman noted that his first grain year, 2012, there was almost no yield to speak of due to drought. In 2013 and 2014 he said they got more rain and had a better grain crop, but yields were only around 300 lb/acre. However, Dr. Jungers has said there is potential for Kernza® yields of 1500 lb/acre, and points out that yields are increasing with every plant breeding cycle and as we learn more about the agronomics. Jungers said they’ve observed grain yields fall off after the third year of growth as corroborated by both Fernholz and Erisman. University of Minnesota has some different experiments considering ways to revitalize grain production in older intermediate wheatgrass stands. In 2016, Fernholz’s fields had low yields and decided it was not worth harvesting. So he tried something. “The intermediate wheatgrass has really gotten itself sodded in. So grain production this past year was virtually nothing. So, what I did this fall was I went through the plot with a chisel plow and stripped it to see if it would help to thin out some of the tillers to stimulate regrowth and rejuvenate grain production.” Erisman tried another approach to revitalize his 2011 stand. “We interseeded red clover into the old stand, because I’ve noticed with the old stand that the seed production isn’t as good and it has become very rootbound. I didn’t want to disturb the soil too much, so we went out with a no-till drill and set the coulters as deep as we could, just to cut the roots while seeding the clover at 10-11 lb/acre on the surface. The red clover is doing very well and it doesn’t seem to have hurt the wheatgrass at all. But we’ll see if we get any grain stimulation from that.” The expectation is that the clover will fix some nitrogen and its roots will loosen the soil. Agronomic research to improve production of intermediate wheatgrass is ongoing, and several new efforts have been initiated in the last year. The University of Minnesota and Michigan State University recently began a two-year research project funded by a Ceres Trust grant that will study the effects of grazing on the intermediate wheat grass and assessing Kernza® yield and quality. The research aims to test if the crop can offer dual use: grain for flour or brewing and pasture for dairy cows. Trials were set up in the fall of 2016 on University and farmer’s land. Here in Michigan, intermediate wheatgrass was planted at Kellogg Biological Station and at Hampshire Farms in Kingston, MI and is slowly waking up from its winter dormancy. We will be putting dairy cows on it this year on some plots and other plots we will allow to set seed for harvest. Watch for information regarding upcoming field days at one or both locations this summer. These events will offer a place to learn more about our findings and possible ways to grow intermediate wheatgrass for grain and forage! 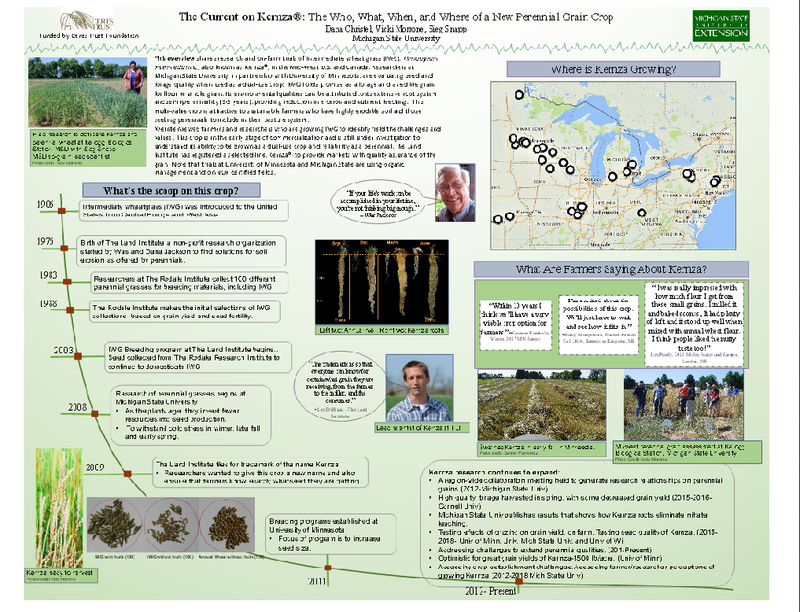 We recently presented the following poster during Agriculture and Natural Resources week at Michigan State University. Click here to read it up close! Earlier this month General Mills announced they’re working with The Land Institute to incorporate perennial food grain Kernza into cereals and snacks under its Cascadian Farm organic brand. Read the article from the Washington Post. In the article, Kernza is described to be “sweet and nutty-tasting”. Last week a Michigan farmer baked us some scones using whole Kernza flour, and we second that statement- sweet and nutty with a beautiful, toasted brown color. Its fun to wonder what other food products we might find Kernza apart of in the coming months and years! Lemon poppyseed scone baked with Kernza flour. Wheat may be one of the first crops that comes to mind when the state of Washington is mentioned. I can picture rolling hills covered in swaying waves of golden wheat seed heads. I think dry, I think wide open spaces, I think of a large combine making its way across the plains. Of course, the state as a whole represents a myriad of agricultural systems due to diverse geography and varied microclimates, so the image described probably best represents the eastern part of the state. However, even on the western parts of Washington there have been efforts to breed wheat that thrives in a different environment and meets the needs of farmers in that region. Dr. Stephen Jones, wheat breeder and director of The Bread Lab at the Mount Vernon Research Center, has been working to develop regionally relevant varieties of grains such as oats, barley and wheat since 2008. Also among those projects is developing a perennial grain and forage crop from wheat, a breeding effort that began back in the 1990s at the Pullman campus of Washington State University on the east side. When Jones made the move to the other side of the mountains in 2008, the perennial project was put on the back-burner. That is until Colin Curwen-McAdams joined Jones’s team as a Ph.D. student to revitalize perennial grain breeding efforts and focus them on the coastal Northwest, between the Cascade Mountains and the Pacific Ocean. Early efforts in perennial grain breeding at Pullman included planting out different germplasm from collections all over the country and making crosses between wheat and related species. Curwen-McAdams planted a little bit of everything Dr. Jones’ program had developed over the last 20 years and started making new crosses of wheat and wheatgrass species adapted to the western part of the state. Thus began the journey of breeding a perennial grain and forage crop for this coastal region. There are different pest and disease problems for grains here. Nestled against the Puget Sound, crops in this region experience moderate winters and summers with abundant moisture, an environment very different from eastern Washington and most places inland. Young Tritipyrum plants. Photo credit: Colin Curwen-McAdams. Curwen-McAdams points out Triticale, the product of crossing rye with wheat, as an example. It’s given its own name, isn’t expected to fully behave like wheat or rye, and with that has a different place in the market. Curwen-McAdams refers to the purple and blue spring wheat breeding, another project he works on, to further explain, “The only market classes for wheat now are red and white. By breeding something that is outside market classification you immediately remove any sort of potential market for it and you also remove any pricing structure that’s been placed. With that there’s a potential to redefine what the price of that grain is based on what the farmer needs from it and what it can do for the community.” I found this a very interesting point made for developing a crop for a specific area, and something to certainly keep in mind as breeders continue to make advancements on perennial grains. Naming a new crop is not only important in the realm of marketing and bringing consumers on board, it’s also important for scientists to effectively communicate their progress to one another. Curwen-McAdams, Jones and several other scientists just published an article in Journal of Genetic Resources and Crop Evolution suggesting the nomenclature for one of the stable lines they’ve developed, a cross of Thinopyrum ponticum and Triticum aestivum, as ×Tritipyrum aaseae after Dr. Hannah Aase who contributed to early efforts working with these hybrids. “At this point it is its own thing separate from its two parents,” said Curwen-McAdams. The article is open access at SpringerLink. Click here to read it. Jerry Glover, Senior Sustainable Agriculture Advisor for the United States Agency for International Development, has been an important figure in perennial grains research. He was recognized as a National Geographic Emerging Explorer in 2010 for his work on soil health and perennial grass systems at The Land Institute. He has been an author of several significant papers on perennial agriculture, and worked to display perennial root systems at the United States Botanic Garden. Today he continues to be influential in communicating the benefits of perennial systems and promoting perennial crops in agriculture in the developing world. I had the pleasure of meeting with Dr. Glover over a warm cup of tea on a snowy day in Michigan and ask about his work over the past 20 years. Glover shared his lightbulb moment of inspiration, tactics he uses to engage audiences in the topic of soil health, and his thoughts on perennial grain Kernza®, recently introduced to food markets by The Land Institute. Q: Can you walk me through the history of your involvement in perennial grains work? Why did you choose to work with perennial grains? A: I had one of those Eureka moments. I was in Kansas in 1996 doing research comparing soil quality between organic and conventional farming systems. I was seeing differences between those two types of systems, but I wasn’t really impressed with the differences I was seeing. So then I wondered, what does soil quality look like under natural grassland ecosystems? Luckily, I was able to find a relatively intact prairie meadow with the same soil type as the farms I was studying. I was looking at soil aggregate stability, soil C, N, and P levels, among other things and found that the meadow had much greater soil quality, especially organic matter than the two farming systems I studied. I found out that a farmer had been haying this meadow for a while. I started doing some back of the envelope calculations while I was in the field to figure out the nutrients taken off in the hay, and it was then that I had this sort of epiphany: perennial grass systems can support similar nutrient yields as annual agriculture, but without all the depletion of soil organic matter and soil quality. So I went back to Washington to finish my Ph.D. and then I returned to The Land Institute to set up some more rigorous studies. I worked with an interdisciplinary team of ecologists and soil biologists and we studied above ground food webs of insects, looked at nematode populations and other chemical, biological and physical soil properties of perennial grass systems. We found that these systems can sustain harvests of similar levels of N, P, and K as annual wheat systems. We found that with no N fertilizer inputs that N was still getting into the soil. Now part of this has to do with legumes being present in some of those ecosystems but I credit biological N fixation in and around the perennial grass roots to be a big part of soil N in natural grassland soils. So I got really excited about everything we were finding, but you can’t really eat hay. So how do we emulate this in a viable way in our agricultural systems? And I thought perennial grain crops were a remarkably feasible and revolutionary way to do so. Q: In what capacity are you working with perennial grains now? A: In my work now I deal with a wider variety of farming systems and it’s a much wider scope dealing with more socio-cultural aspects. Though the geographic and thematic scope of my work has expanded I still include and talk about perennial grain crops a lot in my work. Q: There’s a popular picture of you with roots that shows up in a lot of articles about perennial grains and I notice in many of your talks that you bring a perennial grass with long roots to show to your audience. How has this imagery helped influence, educate and inspire people? A: When people see perennial grain crops growing above ground next to annual crops, they look pretty similar and there’s little indication of the differences in the benefits or services they provide. But when you look below ground it’s easy to see those differences. I used to try to explain the benefits by talking about the good things perennials do for soil, but this does not capture people’s imaginations. It bores people. But when you show the roots it inspires people to what the profound implications of those roots are below ground. Using the roots as a prop is a tool to sustain people’s interest but transfer their attention to the more important topic of soil. Showing the roots seems to change the nature of questions from an audience. Instead of asking big picture questions about how perennial grains can fix societal problems, they start to ask more questions about how the roots absorb nutrients or retain water. Those are the things I want to talk about. Q: What’s the biggest barrier in perennial grains work? A: Plant breeding. Perennial grains can’t catch on in countries because they don’t really exist yet in viable forms that can compete with annual grain crops. I see big potential in some perennial legumes in the immediate future in developing countries, such as those we work with in Africa, but even there, varieties need to be improved to be more widely used and with better effect. Q: Let’s talk about Kernza® for a little bit. Kernza® has been one of the most promising perennial crops coming out of The Land Institute. It seems though, that there might be a lot of management required to maintain grain yields over time. Do you think that the management needs would negate the benefits of growing a perennial crop? A: Disturbance might make a system more productive. Well established perennial grass systems aren’t cycling a lot of nutrients. Using some kind of disturbance, such as grazing or rotations, might keep perennial systems in what ecologists have called a mid-successional state so that nutrients are more actively cycling might be the best thing. I think Tim Crews at The Land Institute is looking at how disturbance can play a role in sustaining productivity. So even if we would have fields of Kernza® that measure 25% less in soil quality than prairie, that is still remarkably better than annual wheat fields. But, yield is no small concern. We don’t want to have to use twice as much cropland to grow the same amount of grain. Q: Do you think that Kernza® is best suited for a particular region or farming system? A: What is exciting about perennial grains and Kernza® is that we are adding to the toolbox of options for farmers. By providing one more economically viable option for a crop to grow, you’re automatically increasing diversity. I think it will be interesting to see how farmers use it in their systems. I could see farmers with livestock getting excited about it, using it in rotations easily and alleviating weed pressure and potentially breaking disease cycles. These multi-purpose options will be important in places where there are land constraints. But here in the U.S. there isn’t really a land constraint so I see farmers using them in rotations. There’s also going to be some differences in the way farmers understand this new crop depending on the region. Here in the upper Midwest and in dairy country I think farmers will see the value in having perennials because they have animals. They’re more used to growing perennials for forage and they’ll see the inherent benefit of having something that is dual purpose for grain and forage. Farmers on the prairie might not grasp that as well, but they do understand the cost of planting, fertilizing and managing weeds every year. So if they can see that fewer inputs are required with growing something like Kernza then it will be more attractive to them. For example, there’s a study from Australia showing that the yield of certain perennial crops only has to be 60% of annual crops to be economically viable since there is reduced inputs. Q: It seems like a lot of scientists currently working on Kernza and other perennial crops were part of the Land Institute Graduate Fellowship Program. How do you think that has contributed to success? A: I think that the graduate research fellowship was an important catalyst for expanding perennial grains research in the U.S. and throughout the world. Without that effort I think that the perennial grains community would be a lot smaller, and given the small amount of money allocated for it each year, I think they got a lot of return on it. I thought it was very successful. Q: What does the future of perennial grains work look like? A: I see two trajectories. Expansion in niche markets in the Western world like with Kernza in things like beer and multi-grain bread as a way to increase awareness and show potential is one way. In places like the U.S. it’ll be only after a significant period of time, due to the time it takes for breeding, for it to expand more widely. Also U.S. agriculture has such high production levels already, so perennial grains have higher yields to compete with here. But perhaps more significant is development and expansion in the developing world where people are resource poor and food insecure. These places have the most to gain and would see those gains more immediately. This is an interesting issue to consider as scientists continue to develop perennial crops that are either domesticated wild grasses or hybrids of an annual crop and wild grass relative.